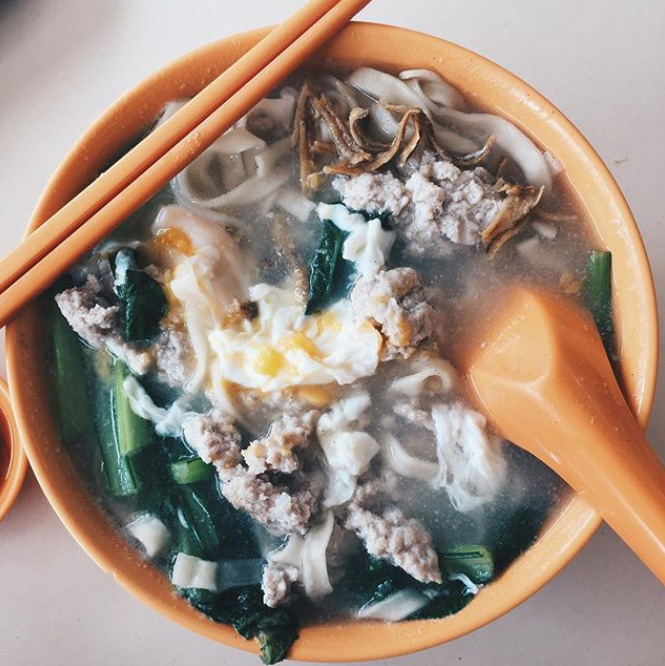 Ban Mian is inarguably one of Singapore’s most famous local delicacies. Yet, in my lifetime I have eaten one too many average bowls of ban mian that feature machine-made noodles floating in a light, lacklustre broth with a few pieces of pork and an overcooked egg. 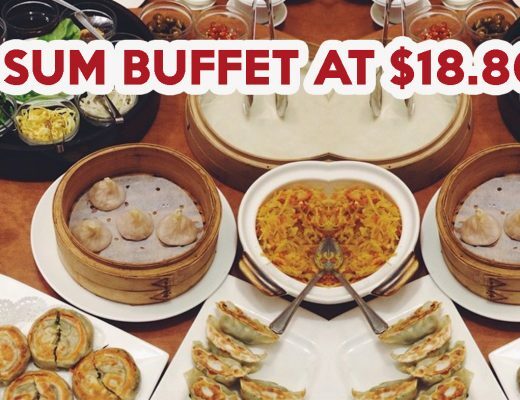 Today, we hope to bring you some of the best ban mian Singapore has to offer. These hawkers serve up bowls of ban mian with springy noodles, soaked in a pork broth that will definitely pack a punch. 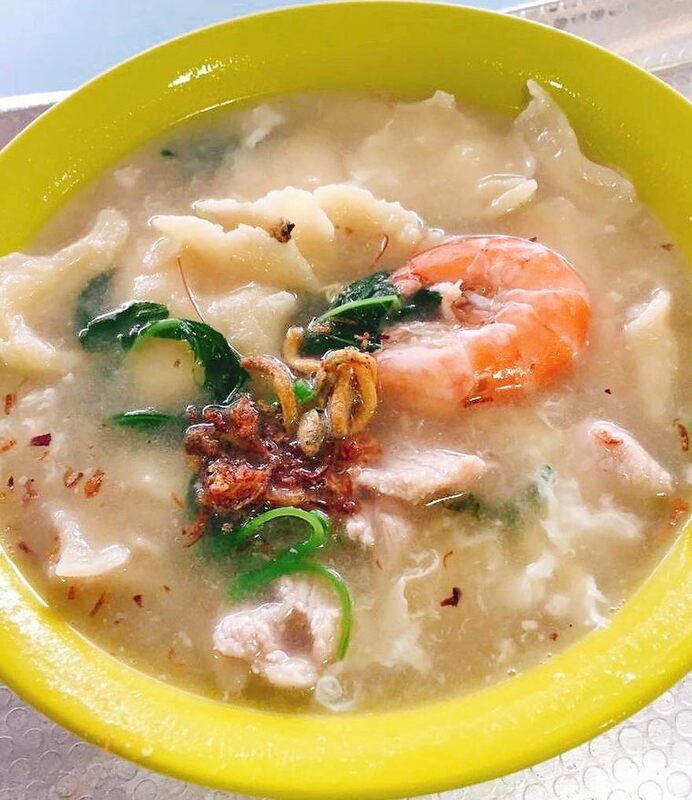 A gem in the heartlands, Madam Leong Ban Mian is started by a single mother, Vivian Leong, who started this business in hopes of supporting her teenage daughter. As hearty and humble as their backstory, Madam Leong Ban Mian serves a comforting bowl of Hakka-style ban mian that’s well suited for the rainy days. 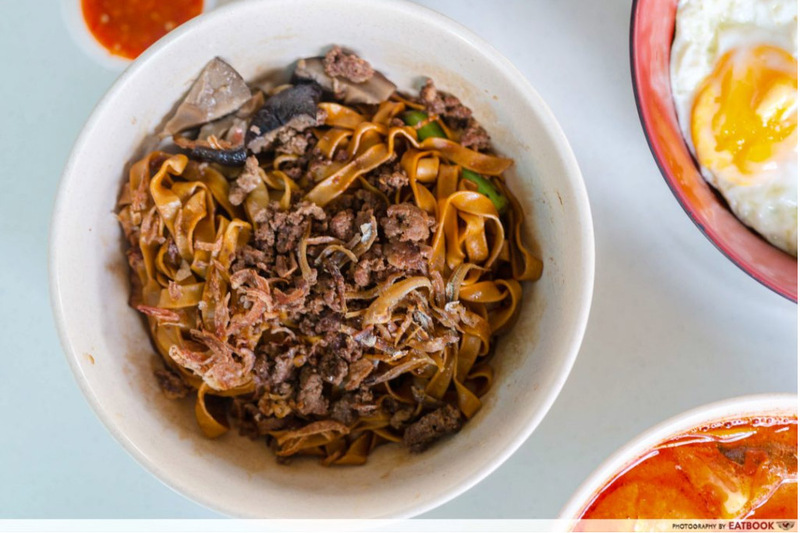 A popular favourite would be their Dry Chilli Ban Mian ($4.50/$5.50), where noodles are tossed in a typical sweet-savoury brown sauce, and topped with braised mushrooms as well as minced pork. Check out our full review of Madam Leong Ban Mian! At Boon’s Noodles, not only are the noodles fresh and made by hand every morning, all components of the dish are similarly made from scratch, such as their freshly fried ikan billis and house-made chilli sauce. Their Mee Hoon Kueh (Soup) ($3.50) comes in a fragrant, light brown broth with a generous serving of pork that’s marinated in sesame oil, as well as a half-boiled egg, sayur manis, and braised mushrooms. Check out our full review of Boon’s Noodles! Qiu Rong Ban Mian is my go-to favourite on a rainy day. Though one of the more underrated stalls, Qiu Rong Ban Mian is a hot favourite amongst Easties, especially students from Victoria Junior College. 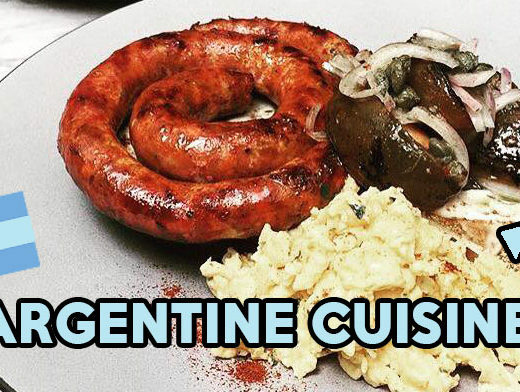 Previously located at the basement of Roxy Square, the stall has since moved to compete with the culinary giants at Old Airport Road Food Centre. The stalls’ Ban Mian ($3) boasts a rich, umami pork broth served over springy, handmade noodles that are cooked al dente. Topped with a molten egg and a generous serving of minced pork, this piping hot bowl of goodness will surely make you feel right at home. Top 1 Home Made Noodles serves both soup and dry ban mian, but they are better known for the latter. 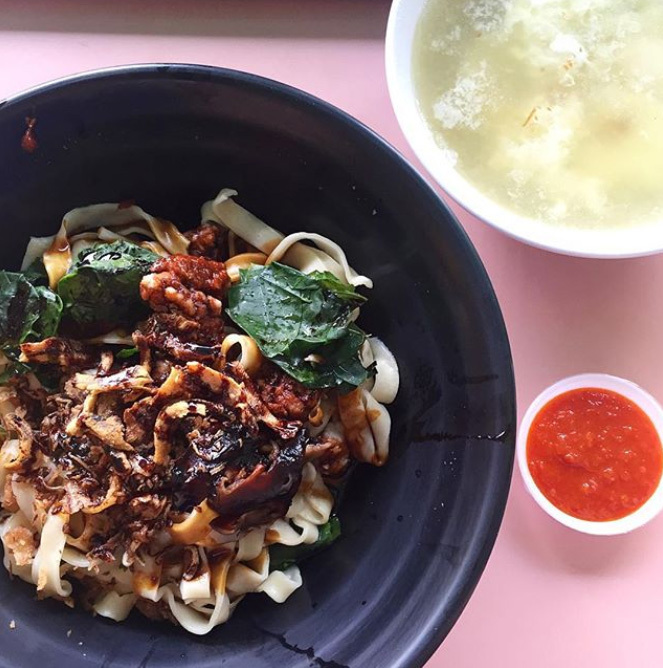 Order their Dry Ban Mian with Chilli ($4) for a bowl of chewy house-made noodles tossed in a mix of thick dark soy sauce and feisty chilli sauce. This is coupled with a mixture of minced meat and pork balls. If you love chilli, their house-made chilli sauce is known to kick things up a notch. 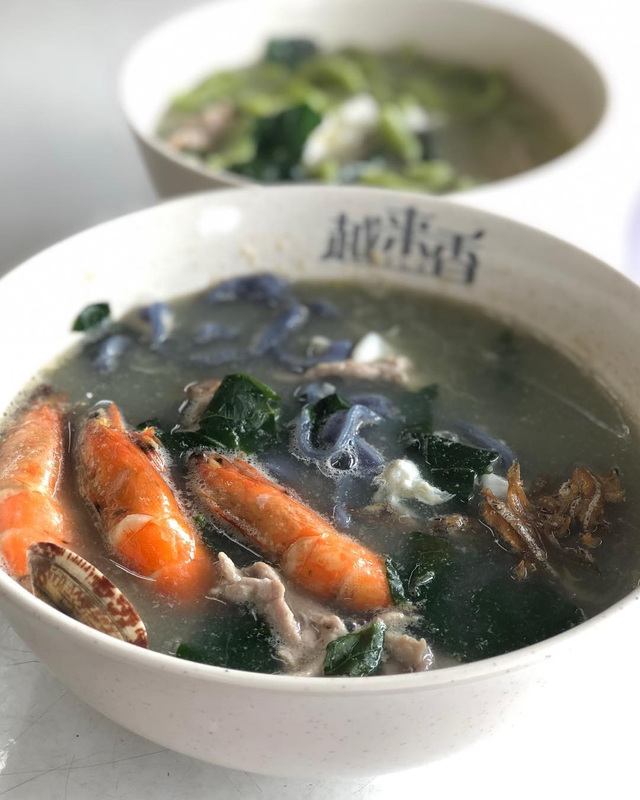 L32 Geylang Hand Made Noodles serves hand-pulled egg noodles drenched in a flavorful, well-balanced pork broth that’s perfumed with a sweet ikan bilis taste. The noodles are not too thick and maintain a chewy texture, while the soup has been painstakingly boiled for 10 hours. Unlike other ban mian stalls, this hawker has a pretty impressive range of toppings including clams. Go for their traditional bowl of Pork Ban Mian ($4.30), or spruce it up with some seafood by ordering their Prawn Ban Mian Soup ($5) for a bit of that sweet crustacean broth. 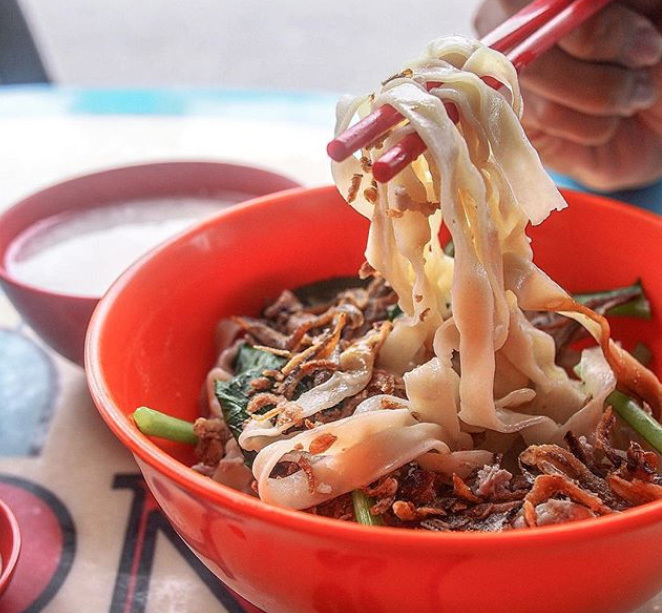 Now here’s an #instaworthy ban mian for the ‘gram. Yue Lai Xiang Delights boasts colourful Ban Mian ($4 for original, $5 for flavoured noodles) that comes in beautiful pink, blue, orange and green hues. Before hating on the unorthodox choice of colours, these noodles are actually handmade with natural ingredients such as beetroot, blue pea, pumpkin, and spinach, giving the noodles an intriguing taste and colour. Served in a robust pork bone broth made without MSG, as well as an addictive chilli sauce made from scratch, this springy bowl of ban mian is both healthy and fun. 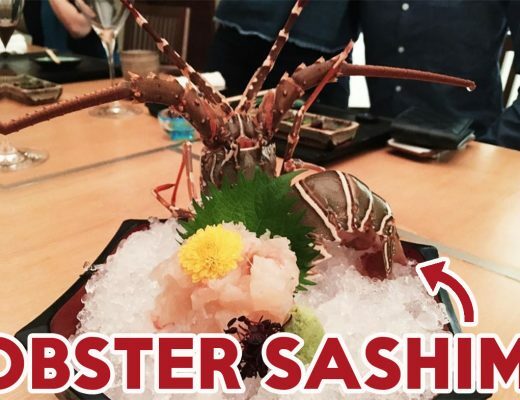 If you prefer a more exquisite broth, opt for the Premium Bowl ($7/$8), which gets you fresh prawns and clams thrown into the mix. 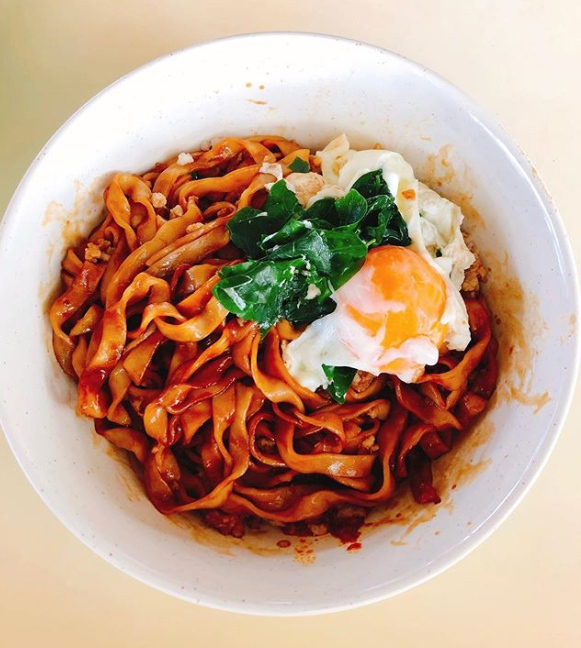 Nestled in the bustling, quaint estate of Serangoon Gardens, Bossi Ban Mian may be a dish often overlooked in Serangoon Gardens Hawker Centre. 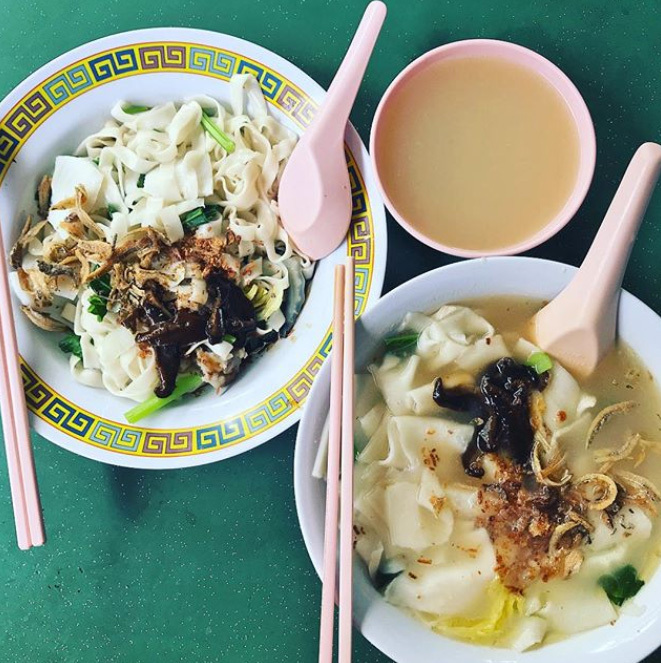 This Ban Mian ($4) comes in both soup and dry versions, and is uniquely served with a smattering of chye poh, which adds a different dimension of flavour to the noodles. Pair this dish with their spicy green chilli sauce, which adds a zesty undertone to the noodles. Expect a slightly sweeter, lighter tasting soup for this dish, where a spoonful of preserved mustard vegetables is added to give the broth a unique taste. 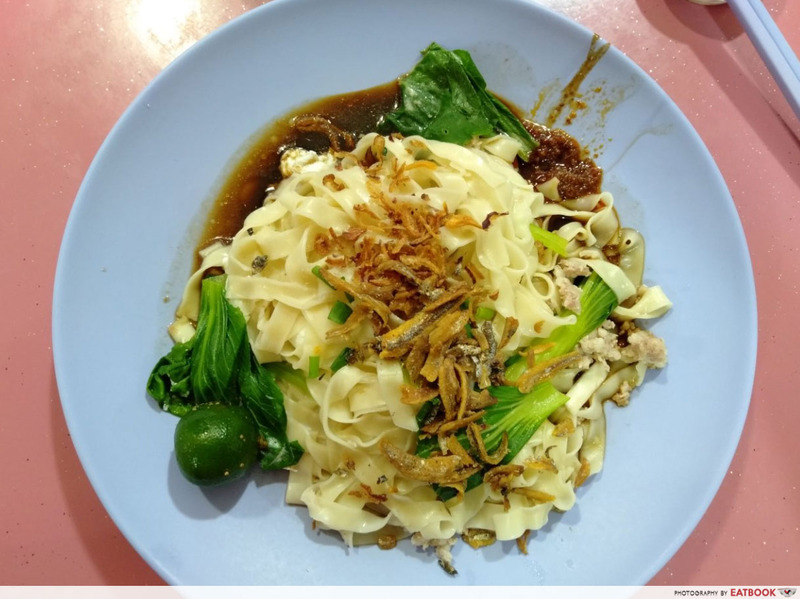 憶玲手工面 Handmade Noodles @ Serangoon North has been a long time favourite to those living in Serangoon North – a formidable counterpart to the more well known Bossi Ban Mian. This hidden gem boasts a plate of delicious Dry Ban Mian ($3.50) tossed in an addictive black sauce and served with a generous portion of crispy ikan bilis. Though not served with a huge portion of minced meat, this bowl usually comes with two crispy fried wontons. Drizzle the noodles with the small slice of lime given, for a zesty and refreshing kick. China Whampoa Homemade Noodles is famous for their signature Dry Home-Made Noodles with Prawns ($4/$5). This stall serves denser noodles, which gives a nice QQ bite. Expect al dente noodles dressed in a generous serving of feisty chilli and a thick caramel-like black sauce when you order their dry noodles. What makes this bowl stand out is the owner’s bold use of wolfberry leaves, which gives the ban mian a slightly bitter undertone. The accompanying soup holds a much lighter and sweet flavour, but complements the hearty noodles well. 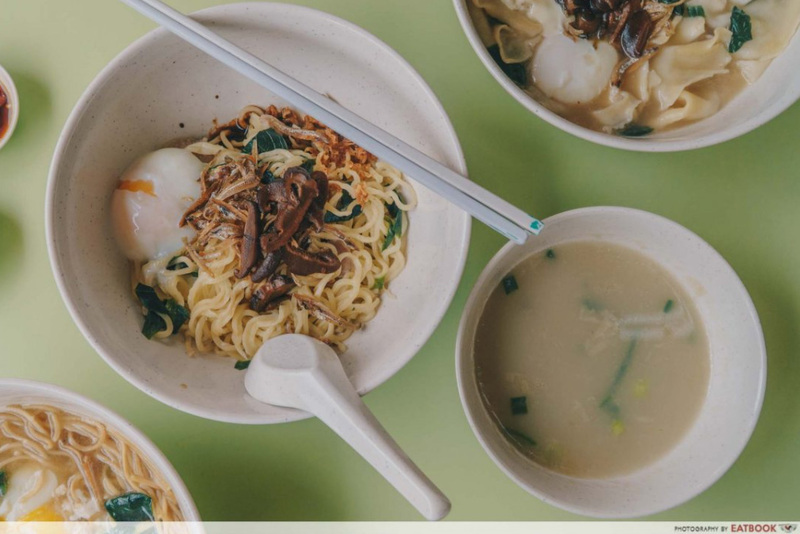 Seletar Sheng Mian Mee Hoon Kway serves hand-pulled Mee Hoon Kueh ($3.50/$4/$5) in a rich, robust and porky broth that has a hint sweetness from ikan bilis and prawns. The dough is made from scratch, and is pulled and thrown directly into the boiling soup, giving the noodles a nice chewy texture. Instead of the usual cai xin vegetable, this stall uses baby spinach for their vegetables, which is a nice and refreshing take to the dish. Do remember to add an extra 50 cents for more of their freshly fried ikan bilis to get that extra kick in your soup. Ban mian never fails to satisfy, with its chewy noodles and tantalising broth. If ban mian is not your thing, you may check out our list of la mian stalls instead!